Department of Budget and Management (DBM) Secretary Rolando Andaya, Jr. today (June 12) led the 110th celebration of Philippine Independence Day in front of the City Hall here. Andaya's party arrived at the city at 7 a.m. to formally start the simultaneous observance of the Independence Day throughout the country. Carrying the theme "Republic Service Tungo sa Ganap na Kalayaan at Kaunlaran," Mayor Casurra expressed with elation that the city was chosen as the venue of the few areas that were highlighted in the celebration of the 110th Independence Day Celebration. "We are fortunate enough that for this year, the city of Surigao has been chosen as the venue of the few areas that will be highlighted in the celebration of the 110th Independence Day Celebration, probably the first of its kind, that in Caraga Region it is being held here in the city of Surigao." 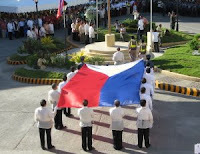 Casurra highlighted the historical act, which took place in Surigao the hoisting of the Philippine Flag in December 26, 1898. "You all remember that the first Philippine flag was hoisted here in the city." Gov. Barbers brought to light the role of the forefathers in the freedom struggle. "There is no fitting way to celebrate our independence in this day of age but by reliving and bringing into reality the visions of our forefathers. The struggle for freedom of our forefathers is in chapter in our history, what is filled in sacrifices and written with their own blood so to speak in order to free us from our foreign oppressors." Sec. Andaya, on the other hand, emphasized the role of the Surigaonons in the fight for freedom. "While the traditional June 12 rites revolved around the Tagalog region, one cannot be denied that the birthing of the first Asian republic was a national enterprise. Most of our history books today recalled the revolution of 1898 on the 8 rays of the sun, confining the struggle only to Luzon as if the struggle of freedom did not cross the sea... ang lenguahe ng paghihimagsik, ang lenguahe ng pagbabago ay hindi lang ho limitado sa pananalog ni Emilio Aguinaldo, lenguahe rin ho ng mga magigiting ang salitang Surigaonon (the language of revolution, the language of change are not limited only to the native tongue of Emilio Aguinaldo. Surigaonon dialect is also the language of the brave.)" "This was the language of Simon, Wenceslao and Florencio Gonzales our father and his 3 sons who echoed the cry of freedom and eloquently in both words and deeds. This (Surigaonon) was the language of those who gathered here on the morning of the December 26, 1898 to witness the first hoisting of the Philippine flag in the island of Mindanao," he added. Meanwhile, at 7 a.m., President Gloria Macapagal-Arroyo led in the unveiling of the flag marker and at the flag raising ceremonies at the Rizal Park.